Stress. We all have it. It manifests in different ways and different times throughout our lives. Maybe it's from a relationship, work, school, friends, or some other responsibility. I feel that I'm pretty good at staying calm under pressure, for the most part, and although I get stressed, I normally go into "action mode," rather than just lying down and crying, even though sometimes that's all I want to do. This past week has been stress-central at our house! Quite suddenly, I got a bunch of orders on Etsy that needed to be filled (Wahoo! ), Halloween was on Thursday, a friend needed help on her son's Halloween costume, a fellow blogger and sis-in-law asked me to join in on a giveaway (more information coming! ), I still have to be a mom and wife, etc. etc. Even though I LOVE all of these activities, it's just a stress to have them all at once! Boy, was it a crazy week! 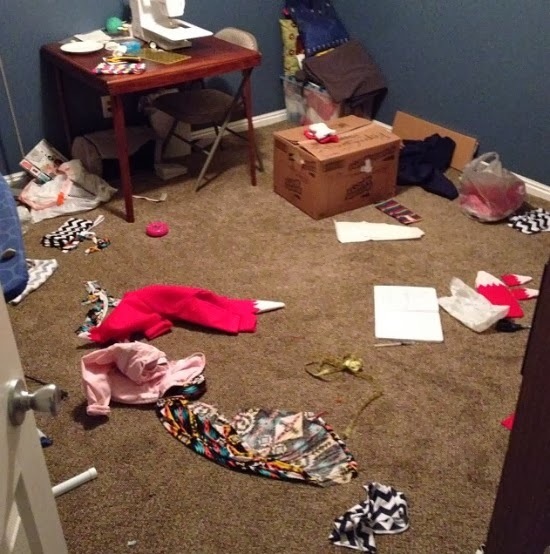 My craft room turned into a post-war-zone (a war which I won, by-the-way) with scraps of fabric parts lying all over the floor after being discarded by the enemy. Honestly, I haven't been so stressed out since college! I took a geography class in school (mind you, it was a BEGINNING geography class, too), and there are a few things that I did wrong, right at the get-go! There finally came a night where I completely broke down and had an anxiety attack, which has NEVER happened to me before. It was a rough go, and definitely something that I never want to experience again. So here's what I would suggest for any students in college anywhere, addressing the same issues that I experienced while taking Geography 111. 1) If you know you're the kind of person who likes to stay out at night and hang with friends and then do your homework once you get home at midnight, don't sign up for an early class. Know yourself and your habits. 2) Do some research on your professor (I've discovered that ratemyprofessors.com is a pretty reliable site). It might take you a little time, but even if you hate researching, you'll be glad you did. 3) Try to take a class with some friends, or upon arriving to class, search out the smartest and/or nicest looking kid in the class and sit with them. If you don't have any friends already in class, make them. 4) Research other ways of acquiring textbooks. Financial instability is one of the leading causes of stress (I don't have a scientific resource of this information, but it is, wouldn't you agree?) Sure, you can possibly sell back your books at the end of the semester, but I said, "possibly," and, unfortunately, you get about 10% back of the original $250+ you spent on it (seriously, I remember getting $25 back for a $250 book). Plus, the lines are unbelievable. Trust me, I'm all for buying my books so that I can do whatever I want with it and have it be my own, but here's the thing; Campus Book Rental allows for the book to kind of become your own while you have it! Here, watch this video. K, I took some notes, because it's habit. I know, right? Amazing. But that's not it. You can also make money by renting your own books to other college students. You get to keep your book and rent it to other students, making you two-four times more money than you would by selling your book back. Lastly, Campus Book Rentals believes in giving back to the world-wide community. They have teamed up with Operation Smile to help provide surgeries to children with cleft lips and cleft palettes. Medical bills are also a huge stress and blow to the finances, so many families can't pay for it. Campus Book Rentals helps with that. With each book that is rented, Campus Book Rentals donates to Operation Smile. "Operation Smile is an international children's medical charity that heals children's smiles, forever changing their lives. As an international charity for children, we measure ourselves by the joy we see on all of the faces we help. At Operation Smile, we're more than a charity. More than an NGO. We're a mobilized force of medical professionals and caring hearts who provide safe, effective reconstructive surgery and related medical care for children born with facial deformities such as cleft lip and cleft palate." We are having one of those type of "stress" weeks at our house too! Hang in there friend! !